Jet Fuel | Virent, Inc.
Air travel has changed our world for the better, enabling settlement of communities, fueling commerce, facilitating the exchange of goods and fostering relationships that could not have existed for previous generations. While air travel makes our world a smaller and better place, there are significant costs associated with the energy needed for flight. Passenger, cargo and military air transportation place significant demands on very specialized jet fuel derived (historically) from crude oil. Fortunately, there is significant movement to adopt sustainable jet fuel alternatives. Virent’s patented technology enables the production of jet fuel from bio-based feedstocks. Our BioForming® process produces industry-ready molecules for high performance jet fuels. 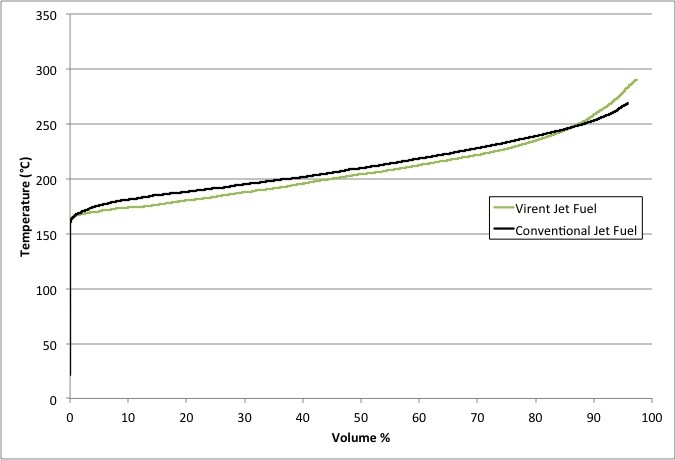 Our technology uses a wide variety of both cellulosic and conventional plant sugars, providing an economical route to sustainable bio-based jet fuels that are identical to their existing petroleum-derived counterparts as shown below in these boiling point curves. Because of these similarities, Virent’s jet fuel can be “dropped-in” to existing petroleum refining infrastructure such as pipelines, tanks, pumps and aircraft engines of all kinds, offering sustainable jet fuel without additional manufacturing investment and uncertainty. Virent is developing two jet fuel products: Hydrodeoxygenated Synthesized Kerosene (SK) consisting of C9-C16 paraffins and naphthenes and Hydrodeoxygenated Synthesized Aromatic Kerosene (SAK) consisting of C9 — C11 aromatics. The abundance of cellulosic and conventional plant sugars allow for significantly higher commercial volumes and lower feedstock cost compared with seed oils, jatropha, and other lipids. The BioForming® process can produce normal and iso-paraffins, naphthenes, and aromatics required for a fully renewable jet fuel by blending the SK and SAK products. Other technologies do not readily produce renewable aromatics and must rely on petroleum-derived sources. The chemical properties of our jet fuel meet or exceed all the key requirements for petroleum-derived jet fuel, with good energy density and superior performance at cold temperatures. These properties are achieved without an isomerization/hydrocracking step, which results in a yield loss in other technologies. Read about Virent’s DOE grant to produce jet fuel from corn stover. Virent can produce the sustainable, high-performance jet fuel you require.